You are here: REDWOLF > Home > News >News Detail - New Deep Fire Grenades!! We've got a couple of new innovative fragmentation type airsoft grenades exclusively at Redwolf Airsoft. 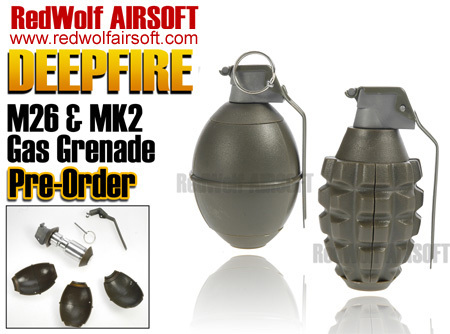 The MK2 and M26 from Deepfire are excellent airsoft versions of the real grenades. These products are definitely setting the standard in the World of airsoft, as there aren't currently many similar products on the market. The Deepfire MK2 and M26 are filled with BBs then filled with gas, and then the grenades are ready for action. Simply pull the pin out, throw it at your target, then after a few seconds the grenade explodes open, spraying the load of BBs accompanied by a reassuringly loud "bang" sound. The shell plates are blown clear away from the core of the grenade, creating a fragmentation effect in addition to the flying BBs! For safety reasons, the shells are made from soft plastic that are safe to use. These shells can also be purchased separately (at a later time after initial launch). You will be able to purchase MK2 and M26 type shells, which will fit either of these grenades you see here. Basically both use the same innovative gas core. We got the chance to test the grenade, and they are certainly objects of joy. Who would have thought that so much fun could be had with a tiny object? It proved to be very easy to use, and simple to use in practice. The grenades can be easily disassembled for maintenance, and is made from a durable ABS plastic material to take the knocks that it will take from being thrown around the place! We found that we had just as much fun exploding just the surface shells, loading the grenade with BBs, or filling it with baby powder to create a massive smoke cloud on detonation! Charge HFC134a or GREEN / TOP gas into the bottom just like you would a gas pistol - it's that simple and easy. Want to get your hands on one? 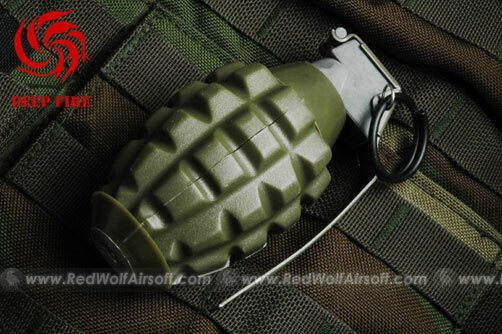 Redwolf Airsoft have the exclusive on the Deepfire Grenades, so Pre-Order yours now to avoid disappointment!! The first batch will be very limited run so grab one before they run out. Click on the grenades below to have a closer look and PRE-ORDER them now. Check out the video too!! !